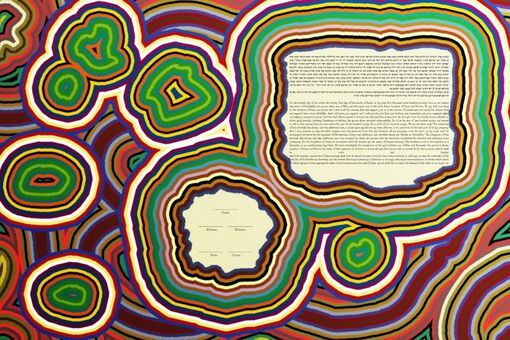 The Balgo Hills (Wirrimanu) Aboriginal community in Australia has one of the most unique artistic traditions in the world: the bright colors and patterns — bringing the heat of the desert alive onto the canvas, in a style that resonates with the Jewish experience. The Balgo Hills Ketubah is perfect for a couple that loves original traditions, a modern vibe to it — and the desert feel to it all. Our religion was likewise born in a desert and our forefathers were fundamentally nomads — and many Jews today remain nomads wandering around life as well. Recommended material for this Ketubah: Decore Giclee or Wrapped Canvas. All Ketubot are limited editions of 100 prints.